So again, before I start, a lot of what I base my posts on are inspired by sections of my God Girl Bible 2011 by Hungry Planet. Great Bible, I recommend it for my lady readers. 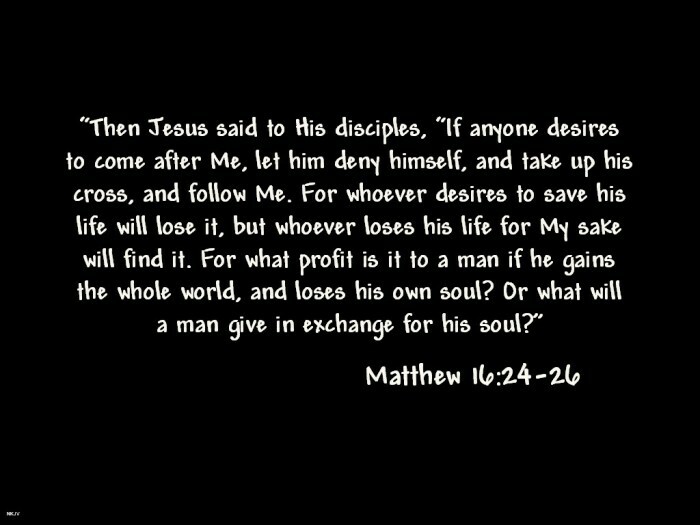 Anyway, today I want to write about following Jesus, a lot of what is discussed in Matthew. The gist of Matthew: The book of Matthew was of course written by Matthew, a tax collector and disciple of Jesus around AD 55 to 80. He was located in either Palestine or Syria, and he wrote to Jewish Christians. Matthew was one of the men traveling with Jesus. He really got to know Jesus and all He was about. In this book, Matthew writes mainly to express that Jesus was the real Messiah that had been predicted. A lot of what Jesus said seems radical, and somewhat offensive to us. “Deny yourself and take up the cross.” We often think to stand up for ourselves, so these words made no sense to our natural minds. Jesus wanted us to forget the self-protecting, self-promoting, ect. In Matthew 6:24 he asks people to consider themselves significant only insofar as they serve the master. Before Jesus, people sacrificed animals in order to clear them of the wrong they had done. But now we have a permanent sacrifice: the blood from the lamb they call Jesus. When Jesus taught he told the people that anger is just as bad as murder, and lust is the same as adultery. Our human nature is of course to sin, but Jesus took it all, so that we aren’t condemned to Hell. Giving your heart to Christ means life is no longer your own, but has been given to Him. Focus not on yourself, but the God you live for.